The giveaway is still happening! 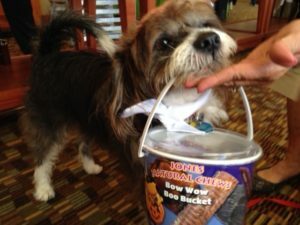 Enter now for a chance to win yummy Venison Entree Sausage treats for your dog!! It’s Way Back Wednesday, in conjunction with Wordless Wednesday, and we’re going to look back at the early days of the blog! My dogs, Flash and Patches, have been Jones Natural Chews fans for ten years, but have only really had access to more than Pig Ears for the last three years. All natural and made in the USA – what’s not to love? 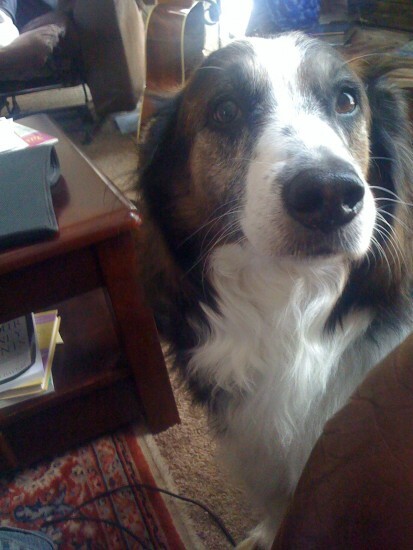 Patches’ mama was an Australian Shepherd. Her daddy was the German shepherd who snuck in under the fence *blush* Patches swears she’s Jones‘ biggest fan. 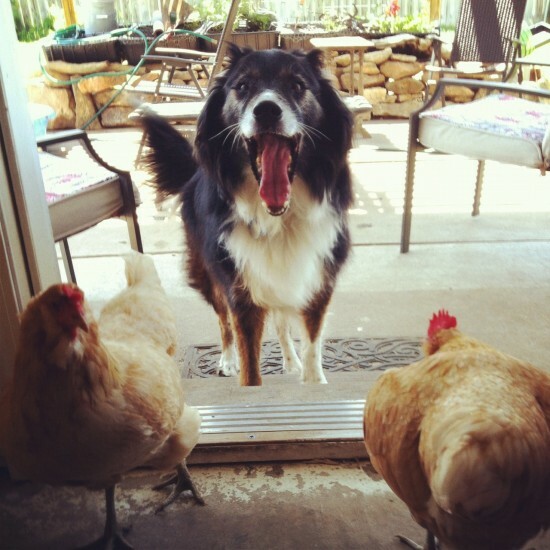 I know he looks like the Big Bad Wolf here, but Flash eats chicken only if it’s Jones chicken taffy. Honest. Jimmy in a bow tie. Jimmy was an early contributor to the blog. By contributor I mean that he had to wear bow ties and hats. 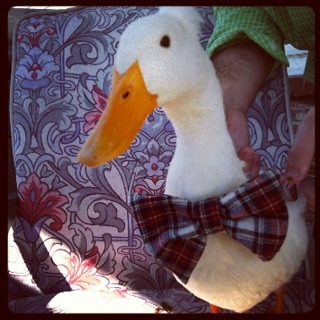 Because duh – a dressed up duck! The Windee Rings make dogs sit up and beg. And then they smile. 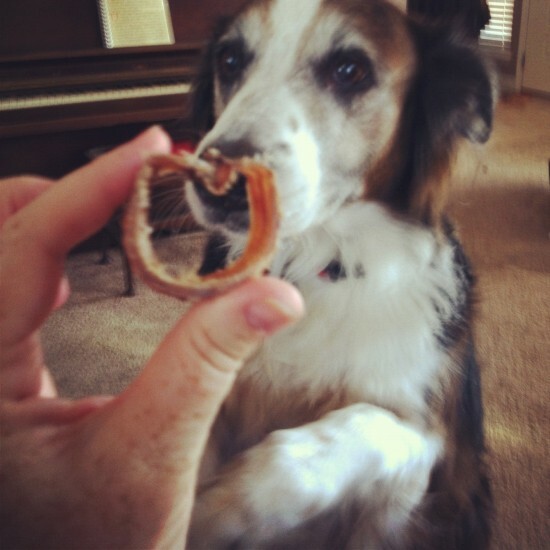 Patches wants me to remind you all that she’s been eating Windee Rings for her senior joints for several years. 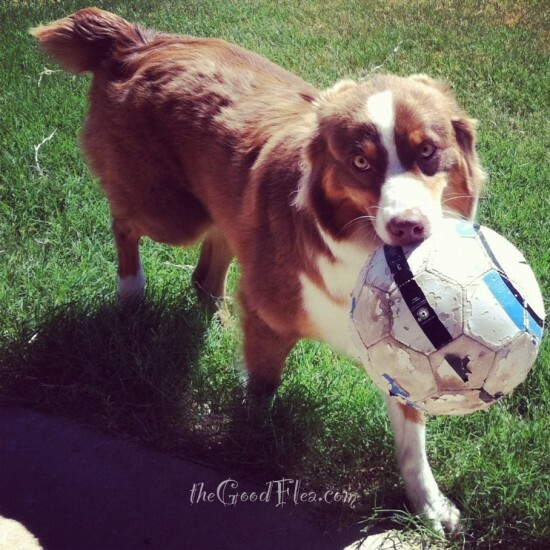 It’s one of nature’s highest sources of glucosamine and chondroitin, great for arthritic dogs. And along the way we’ve been to agility trials and dog shows and plenty of fun dog events. 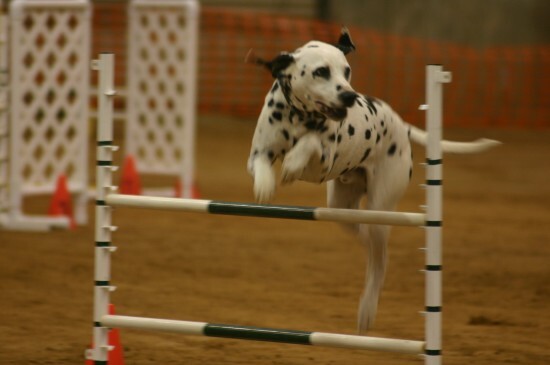 This Dalmatian in motion was beauty in action at the AKC National Agility Trials. Jones Natural Chews Christmas party, The Dells, WI, December something – stay tuned! Exciting, yes? Next year promises to be even more fun! What you don’t see in this list is the traveling I do getting to these events, including the people (dogs who think they’re people) with whom I stay. For instance, Stella Rose, when traveling north. 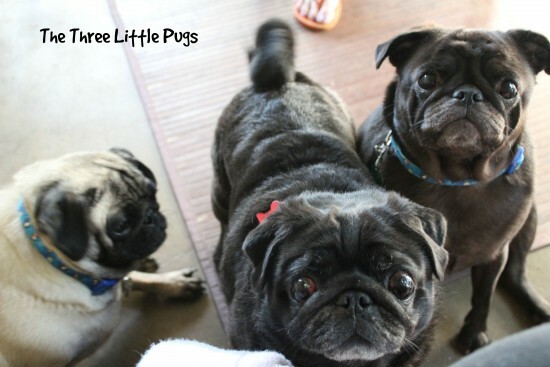 The three little Pugs have their own blog. You should visit them. They’re very cute. And sassy. Oh my, they’re sassy. And this charmer, Mercy, when I head to Atlanta. 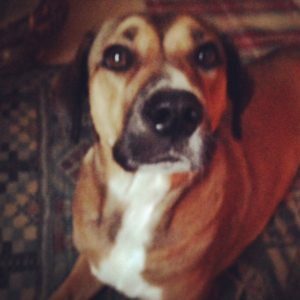 In Jackson, MS, I met Mercy, a Cur mix. Isn’t she lovely? Mercy and Chewy played hard the entire time I was there. Mercy’s mama is a long time blogging friend, at Fresh Fixins. Not to mention the bazillion dog friends I hang out with at BarkWorld. I think this is Ricky, Jan’s dog. What a cutie pie! He LOVES Jones Natural Chews. Naturally. Thanks for joining us on Way Back Wednesday. Now y’all scoot. 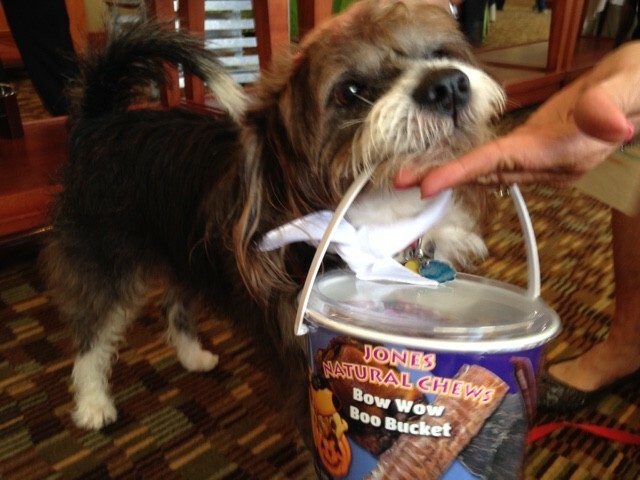 Give your dog a Jones Natural Chew. Enter the giveaway. Like our Facebook page and follow us on Twitter. You’ll love it all. Naturally.